This article is currently being redeveloped in the sandbox User:Krusty/Sandbox2, by Krusty. However, you are welcome to help in the discussion/construction of this ongoing project by using the talk page of that sandbox—your input will be appreciated. If no editor has made any changes in a while, please contact the main editor via the talk page or, if they're inactive, remove this template. This WIP notice was originally posted on Krusty (talk) 17:41, 15 January 2014 (GMT). Maven Black-Briar is the matriarch of the Black-Briar family, and unofficially controls most of Riften. She is the mother of Hemming Black-Briar, and grandmother of Ingun and Sibbi. Maul is her right hand man and enforces her will in the city. She has strong ties with both the Thieves Guild and the Dark Brotherhood. Maven lives in Black-Briar Manor, although she spends most of her day inside The Bee and Barb. Maven seems to like strong-minded people and will complain about Brynjolf recruiting people with no backbone into the Thieves Guild, if you apologize to her when you first meet. Maven wears fine clothes with fine boots along with a leveled necklace and ring. She carries a belted tunic, her personal key, the Black-Briar Manor key, a leveled dagger, a potion, and a selection of upper-class items and gold. She knows the spells Lightning Bolt, Sparks, and Steadfast Ward. Her brewery, Black-Briar Meadery, is in fierce competition with Honningbrew Meadery, and Maven will ask you to put the owner Sabjorn out of business during the quest Dampened Spirits, following which it will be, in the words of the new owner "converted into Black-Briar Meadery West". 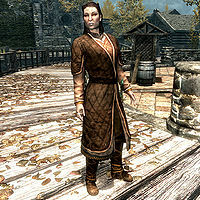 Maven makes no secret of her ties to the Thieves Guild and Dark Brotherhood, and often says she will call on the Dark Brotherhood to kill anyone who crosses her, in spite of any progress you have made in either of these groups' questlines. These threats are empty though and she will never act on them. However, should you choose to betray the Black-Briars in the quest Promises to Keep, a group of Black-Briar Mercenaries will be sent to kill you. Maven will become Jarl of Riften if you choose to aid the Imperial Legion in their Reunification of Skyrim, or trade Riften for Markarth during the negotiations in Season Unending. If you join the Legion and help the Empire to retake Riften, you will discover in the process that the steward of the pro-Stormcloak jarl, Laila Law-Giver, is in fact a member of the Thieves Guild put in place by Maven to manipulate the jarl into protecting her interests. As jarl, Maven will move into Mistveil Keep with Hemming as her steward and Maul as her housecarl and follow a different routine befitting her new station. As she will tell you during Diplomatic Immunity, Maven supports both the Empire and the Thalmor, as she respects those who wield power. If the Stormcloaks manage to retake Riften, Maven and her court will not be exiled, but merely return to their routines, an indication of the power the Black-Briars wield, regardless of titles. In the basement of the Black-Briar Manor in Riften is a locked room containing the remains of a Black Sacrament ritual, as well as a letter from Maven Black-Briar complaining that her contract has not been carried out. If Riften is under control of the Stormcloaks, Maven may greet you by saying, "I presume you're bothering me for a good reason? ", "What in the name of Oblivion do you want?" or "I don't have time for idle chit-chat. What is it?" After Riften is under control of the Imperial Legion and Maven becomes jarl, she will have new greetings: "The throne suits me, don't you think? ", "My title is just a formality. I've always been in charge around here." and "Jarl Maven Black-Briar. Has a pleasant sound to it, wouldn't you say?" When exiting conversation, Maven may say either "I believe we're done." or "Out of my way." During the quest Dampened Spirits, when meeting Maven after Brynjolf tells you to, she will greet you with "About time you showed up." You will be directed to speak to Mallus Maccius. After listening to her orders, she will end with "One more time in case I wasn't clear. You butcher this job and you'll be sorry." Speaking to her will get you an impatient comment from her: "Shouldn't you be on your way to Whiterun?" You may return to Maven after having spoken to Mallus, but she will only ask you, "Why aren't you at Honningbrew Meadery?" Upon returning to Maven after coming back from Honningbrew Meadery, she may greet you by saying: "I trust you have good news for me." You can tell her the plan has succeeded, and she will reward you with a leveled sword. Talking to her after this will have her inform you, "I believe Brynjolf wishes to speak with you. We're done here." Maven will also attend your installation ceremony as the new master of the Thieves Guild. If you haven't done the ceremony, Maven will tell you, "Not now, you idiot. We'll talk after this ridiculous ceremony." If you are about to talk to Brynjolf or have done so, Maven will also say, "I suppose congratulations are in order. Now don't screw it up." Maven: "Haelga, I like you, so I'm only going to say this one time. If you ever try and "practice the Dibellan arts" with Hemming again, I'll make sure that pretty little face loses its beauty." If she becomes the Jarl of the Rift, she will never leave Mistveil Keep except for quests she is involved in, rendering most of the conversations above impossible. Instead, she will converse with other members of the court. Maul is now her housecarl and Hemming her steward. Maven: "Any word about our little problem in the Ratway?" Maul: "I've spoken to Brynjolf and he assures me it'll be taken care of." Maven: "Next time you speak to him, tell him to clean up his own messes. I'm not about to jeopardize this position for a bunch of low-life thugs." Maul: "I'll let him know." Maul: "My agents are telling me that we've appropriated the caravan from Hammerfell... with minimal losses." Maven: "For what it's costing me, I should be handed the merchandise on a silver platter." Maul: "The coin isn't just for the men, there's a lot of people that need to be compensated in order to make this happen." Maven: "And a hefty cut for yourself too I'm sure. Just see to it the items are secured and the rest disposed of properly this time." Maul: "Halt in the name of the Jarl!" Maven: "Somehow I doubt that will persuade them." Maven: "If they want my city, they're going to have to take it from me personally." Maul: "Protect the Jarl with your lives!" If you were taking Riften for the Empire however, the battle would conclude with this exchange between Laila, Maven, and Legate Rikke, however, Rikke's lines are incorrectly attributed to and voiced by Galmar. Unlike other jarls, Maven will not be exiled to Blue Palace if the Stormcloaks retake Riften and Laila Law-Giver becomes the jarl again. However, after Riften is liberated, Maven can be found walking away from Solitude. Lillith Maiden-Loom claims to be friends with Maven, though Maven never mentions her. Some dialogue incorrectly identifies Maven as the mother of Ingun and Sibbi, while in actuality she is their grandmother. Esta página foi modificada pela última vez à(s) 01h09min de 21 de fevereiro de 2016.